WEN 56222 Lumberjack — One of the great log splitters we cover. 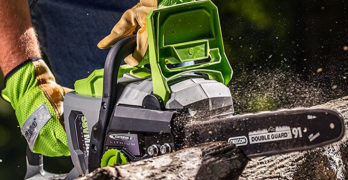 A gas log splitter is designed for heavy-duty wood splitting, but when deciding which model to buy there are some considerations you have to keep in mind. There are advantages and disadvantages when comparing a gas log splitter to an electric log splitter. This article will provide you with food for thought so you end up with a gas wood splitter that you are genuinely happy with. We hope you find this buying guide useful. If you cut or split your own firewood then you know how much of a hassle the work can be. Owning a log splitter will make your job much easier and more efficient. There’s nothing wrong with a good old fashioned axe. It can be a humbling life lesson even, but if you are so over with the back-breaking chore of chopping wood by hand then a log splitter might be in your sights. If you’ve ever looked into purchasing one of these machines, there are some careful considerations to keep in mind. There are several variations of log splitters, but the two main types to consider are gas and electric. Comes with an impressive list of features. We cover this model in detail later in the article. Gas log splitters are perfect for tough jobs that demand it. If you frequently burn firewood and often have large, thick cuts of firewood to chop through, a gas log splitter will be well worth the investment. Plenty of power, making it easy and fast to split firewood all winter. There are many advantages that a gas log splitter can provide for your log-splitting needs. The primary advantage of a gas log splitter is that they are very powerful. They range in power from around 8 tons up to 34 tons or even greater in commercial units. Another benefit is their high capacity for logs. This enables the machine to handle some of the toughest types of logs, including very knotty pieces, with optimal efficiency. Most gas log splitters have tires that make them easy to move around with ease and may also come with a trailer hitch. Of course, the added power and splitting capacity these units have to offer comes at a price. Gas log splitters are typically the most expensive models. They also need regular maintenance to keep them fine-tuned for long lasting use, such as air filter changes and fuel additives when storing it for a period of time. A log splitter is a practical tool to relieve the burden of manually splitting wood. An electric log splitter consists of a motor that runs on electricity from a standard household outlet. These models have some advantages over gas as well as downfalls. 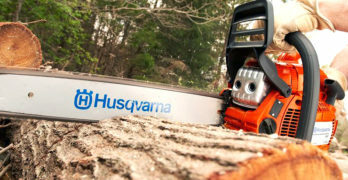 If one of your primary concerns is budget when it comes to purchasing a log splitter, you may want to go with electric. They are typically a fraction of the cost compared to gas and the fact that they don’t require fuel to run, oil, or additional components for upkeep makes them the more cost-effective choice. Compact, portable and runs clean so you can run it indoors safely. Electric models are lightweight in comparison to models with a gas engine and are easy to transport around. You do have to plug it into an electricity source so you will need to keep this in mind in terms of mobility. One of the biggest advantages that electric powered motors provide over fuel-powered is zero emissions. They are safer to use in enclosed areas such as a barn or workshop. They also don’t produce the noise output as gas models. When it comes to performance and power, it would be in your best interest to just invest in a gas-powered model and I’ll explain why. Electric models won’t produce the power that a gas-run model will. If you have really dense hardwood logs to split then good luck finding an electric log splitter that is greater than 10 tons. These models are ideal for smaller logs that are up to 12” in diameter and softwoods such as: Aspen, Basswood, Buckeye, Cottonwood, Spruce, and Poplar. Having said all of that, there is an exception that you should be aware of — the Swisher LS22E Timber Brute Eco Split is an 22-Ton electric log splitter! Yes, you read that correctly. How they achieve 22-tons of splitting force via a 120V electrical outlet is very impressive. Vertical and horizontal log splitting. Road towable. Powerful and electric. Wow! When you have your sights set on buying the best log splitter for your needs, ask yourself the following questions. Gas powered log splitters fall into different classes depending on the work they are intended to do. Factor in the frequency you plan on using your log splitter and the amount of force needed to get the job done when choosing the right type for the job. Consumer-grade: this is a gas powered log splitter that is ideal for splitting logs that are required for personal and recreational use. These range in force from 8-16 tons and are stronger than most electric log splitters. These are capable of splitting logs up to 20 inches long. The only drawback is that they cannot be pivoted vertically and you have to physically lift the log onto the splitter for it to be split. Prosumer-grade: this is a gas log splitter that can be considered if you are splitting logs multiple times in a year. They are faster and more durable than traditional consumer-grade models. These are capable of splitting wider, longer, and harder logs with a ton force ranging from 20-29. It can also be vertically positioned to avoid the strain of lifting logs physically. Includes a Single split wedge adapter. Professional-grade: this is a log splitter that can be considered by those who split logs for a living. They are more powerful and the engine is designed to boost the force beyond 30 tons. These are capable of splitting logs up to 26” long. Made in the USA. Affordable and powerful. We provide more details on this model later in the article. Where will you be using your log splitter? Gas powered log splitters are heavy-duty and can handle the tougher logs you will likely find when gathering firewood from the woods. 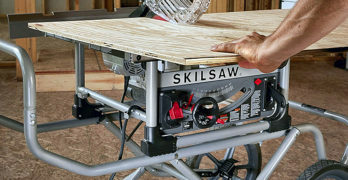 Gas log splitters have the advantage of portability over electric in that they do not need to be connected to an outlet source, but they are heavy. Most models are equipped with wheels that are capable of withstanding rugged terrain. Some also have the option of a trailer with a ball coupler that can be attached to the back of your truck or a UTV, but this is also meant for short distances and not at speeds above 45 MPH. Another factor in location of using a gas log splitter is noise restrictions. Gas-powered machines produce a lot of noise. This means that you may not be able to use them in close proximity to your neighbors, wild animals, or areas where there are noise restrictions in place. Gas log splitters also produce fumes that can be harmful without the right ventilation. It is important to use them in an open location that is a safe distance from entrances to your garage or home. Fiskars X25 and Powerhorse M1175D. The axe can’t compete. What is the average log size you will be splitting? The log length and diameter that a gas log splitter can handle will determine the amount of work you can expect from it. Take into consideration the size and diameter of the logs you will be splitting so you can choose the one that’s the right fit. When you are chopping up logs to be split into firewood, cut them no longer than 25 inches. Also know what types of logs you are splitting. Hardwoods such as Maple, Oak, Hickory, Dogwood, and Elm will require higher tonnage force from a powered log splitter to chop through. A gas log splitter with valuable features can speed up your splitting time, provide convenience, and help cut down your overall costs. Here are some features to consider when you’re shopping around. A gas log splitter that has a fast cycle time means that you will get more work done in less time. This plays a great role in efficiency and productivity. A cycle time of 15 seconds is a reasonable option so you can get back to life’s other demands. When selecting a practical gas log splitter look for one that can hold a reasonable amount of fuel for you to carry out your day’s duties with ease. A continuous supply of fuel will keep the gas log splitter running and avoid interruption from having to refuel. Also, look for a gas log splitter that is constructed with detachable parts for easier cleaning and maintenance. Quality log splitters are designed to perform for many years. The best way to ensure long lasting durability is to opt for a log splitter that is designed with an all steel construction. Log splitters can work in either horizontal or vertical positions. With horizontally oriented splitters you will have to physically lift the log onto it to split the wood. Vertically-oriented splitters, on the other hand, do the work for you by minimizing heavy lifting. You can roll the larger log pieces underneath the wedge to be split without the need to lift it onto the splitter. This makes work easier and safer for the user. Look for a gas log splitter that you can re-sharpen the cast iron splitting wedges periodically. This will give you an efficient and accurate splitting performance for greater longevity and help save you money. Also check the hydraulic reservoir to get an idea of how much it can support in addition to fuel capacity. If you have multiple cords of logs to be split you might want to be sure you have a high capacity fuel tank and hydraulic oil reservoir to maximize efficiency. If you’re deciding on horizontally or vertically-oriented log splitters, factor in where you will be storing it. Vertical models take up less space when storing and will be easier to move around when it’s time to haul it out. Electric models are a good choice if you don’t like getting your hands dirty and you prefer splitting firewood in remote locations. If power and efficiency is what you’re looking for, however, these are among the best gas log splitter models today. 2 year limited warranty with FREE lifetime technical support. 10″ Never flat tires. Easy to move around. Will fit in the bed of most trucks. 50 state compliant (EPA+CARB certified). ✓ View or download the MANUAL for the Champion Power Equipment 90720. This is a very popular brand name among powered machines for homeowners and professionals alike. 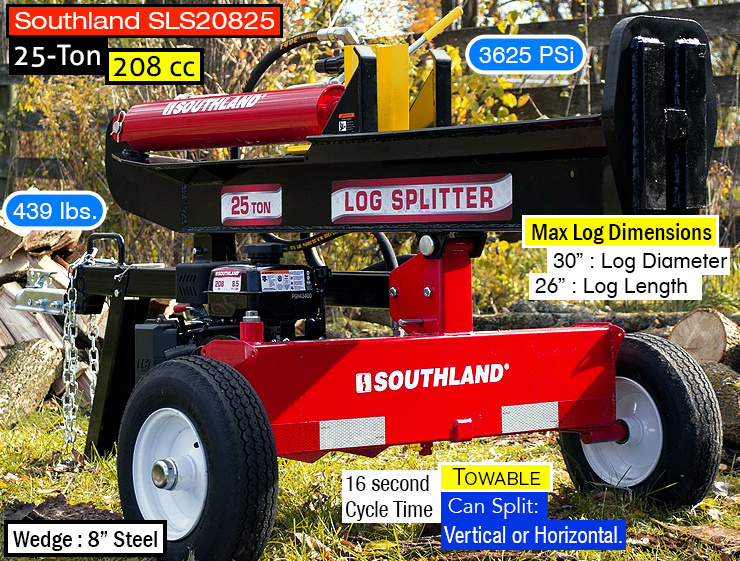 This portable log splitter consists of a Champion 80cc engine. Why does this matter? When you’re looking at gas-powered tools, it’s more than just about the horsepower. Reputable brand names such as Champion are your better bet if you want to ensure you’re getting the efficiency you expect from a powered log splitter. The 7-ton splitter is plenty enough force to chop through soft and hardwoods like Ash, Birch and Cedar wood. It can chop through logs up to 19 inches long and 50 pounds at a cycle speed of 20 seconds. The compact 7-ton log splitter is the ideal size to fit in the bed of most pickup trucks and has a foldaway handle equipped for easier mobility. The horizontal position splitter has a low profile design to make it easier lifting heavy logs onto it so there’s less strain on your body. This log splitter is relatively low in price for a gas-powered model and provides ample power and speed for the average homeowner. A great compact gas powered log splitter. Learn more by visiting the Champion Power Equipment site. Built on a towable frame with an integrated 2 in. ball hitch coupler. 12 second cycle time (no load). 2 in. hitch ball coupler. If you have some serious lumber to split, this 25-ton splitter will get the job done. It has a lot of really desirable features like a horizontal-vertical operation that you can choose from for your convenience. The 224cc Champion engine can tackle larger logs up to 23 inches long and 100 pounds in size at a cycle rate of just 12 seconds. The 5-gallon hydraulic oil system capacity is more than enough to give you smooth operation for the duration you will be using it. Easy to switch from horizontal to vertical splitting. It can fit in the bed of most pickup trucks, but with a weight of over 400 pounds you probably won’t be hauling it around much. The 16” pneumatic wheels are approved by the Department of Transportation to tow it up to 45mph behind a truck with the ball coupler that comes with it. Additional features that add a nice little convenience are the log cradles to keep the split logs on the beam and automatic low oil shut off to protect the engine. Learn more about the Champion Power Equipment 100251 on Amazon. Can be used in both a horizontal and vertical splitting position. 208cc, 8.5 ft-lbs, OHV engine. 25 ton splitting capacity to split large hardwood logs. 26″ log length capacity with a 17 second log split cycle time. a max towing speed of 45 MPH. Versatility to be in a vertical or horizontal splitting position. Tall 8″ heat treated splitting wedge provides maximum performance and longer life. 3-2-1 Year Limited Warranty (steel frame: 3 years, engine: 2 years, hydraulics: 1 year). ✓ View or download the MANUAL or PARTS LIST for the Southland Outdoor Power Equipment SLS20825. This is another versatile 25-ton log splitter with the capability of horizontal and vertical orientation to make it easier for splitting larger logs. It is designed with a full beam and locking pins to secure it in position for ease-of-use. The 208cc OHV engine does all the work for you with great efficiency. The cycle time on this model is 17 seconds and capable of splitting logs that are up to 26 inches long. It also offers portable convenience with a 2” hitch that you can hook up to your truck or ATV/UTV. A unique feature provided in this model is the internal oil delivery system that is designed to keep the internal engine bearings sufficiently lubricated so as to reduce heat build-up. This will help to extend the life of the engine as well. Even the splitting wedge is constructed for long-lasting use. Learn more by visiting the Southland Outdoor Power Equipment site. Excellent log splitter built to withstand the pounding and splitting of wood. 22-ton gas log splitter allows for horizontal and vertical splitting in logs up to 25″ long. 196-cc Kohler engine delivers 6.5-HP. 6.5-gal tank is pre-filled with premium hydraulic fluid for your convenience. Trailer hitch, 2″ ball with safety chains and DOT-approved 16″ tires for easy towing. Auto return and adjustable detent valve. 4″ cylinder with 24″ stroke. 3-year limited warranty gives you peace of mind. ✓ View or download the MANUAL for the Dirty Hand Tools 100171. If you’re looking to really cut down your time on splitting firewood, look no further than the Dirty Hand Tools 22-ton splitter. This is one of the best gas log splitters for efficiency with a cycle time of 10.9 seconds. It will split the hardest types of wood up to 36 inches in diameter and 25 inches long. It is designed to work in both vertical as well as horizontal positions to provide greater versatility between small and large sized logs. You can tow it behind your truck or ATV using the 2 in. ball coupler and it features safety chains! At over 600 pounds, you certainly wouldn’t be lifting this beast into the back of your truck for transporting it. Just in case you were wondering, the 22-ton log splitter is also carbon-compliant. You may be surprised that these aren’t 40-ton and higher gas log splitters, and that’s because it’s hardly likely the average consumer will need this much power. Most of your common types of logs and average lengths of logs will not require more than 25 tons of force. Learn more on the Dirty Hand Tools 100171 by visiting Amazon. Great value. Towable frame with 2-inch ball hitch. Features a 212cc engine and a 4 x 24 inch hydraulic cylinder. Split logs up to 14″ in diameter and 25″ in length in less than 14 seconds. Four hours of operation at half-load on one gallon of gasoline. Towable with 2″ ball hitch. Can be towed up to 45 miles per hour. Backed by a two-year warranty. ✓ View or download the MANUAL or PARTS LIST for the WEN 56222 Lumberjack. Watch the video of this powerful 34-ton of a log splitter. If you’re looking for a high-powered gas log splitter for commercial applications then this is a great option for you to consider. With 34-tons of splitting force it can handle any type of wood you throw at it. 11.5 HP Briggs & Stratton Engine. 34 Tons of force. Can be used horizontally or vertically. Powerful enough to split all types of wood species (hardwood and softwood). Patented Cold Weather Clutch enables easy starts when it’s cold. 5 Gallon Poly Hydraulic Tank provides visibility of fluid levels. Towable (up to 45 mph) : Take it wherever you need to split firewood. Removable Log Cradles helps prevent operator from reaching to ground level for split logs. Vertical Beam Lock ensures the vertical position is secure and safe to use. ✓ View or download the MANUAL or the PARTS LIST for the Swisher LSRB11534. When properly maintained and cared for, gas log splitters can last you through many winters of firewood splitting. They are also a safer alternative to chopping your own wood than the traditional axe and maul. That being said, there are certain guidelines that should always be practiced with operating one. DO read the instruction manual for accurate assembly. If you are unsure on how to assemble your log splitter, call the number provided for customer service or you may wish to bring it to a trained mechanic experienced in assembling log splitters. Do NOT use your log splitter for any other purpose than what it was intended for. It’s called a LOG splitter, so don’t get any crazy ideas as it can also void the warranty that comes with it. DO wear protective gear, including hearing protection as gas log splitters are very loud and can cause permanent damage to your hearing. Splitting wood will cause wood chips to fly so be sure to wear eye protection. Steel toe shoes and gloves are also recommended. Do NOT stand too close to the splitter during operation due to the hazard of flying wood pieces. Be sure any people or pets keep a distance of at least 10 feet away from the machine while it is in use. DO be sure to remove the spark plug wire before performing maintenance or repair to the splitter. Always inspect the log splitter before using. Be sure the hydraulic oil and engine oil is sufficient for operation and check for any signs of leaks or damage. Regular maintenance and service to your gas log splitter is important to keep it in great working condition and is not as tedious as it may first seem. You should always read the user manual for the model you purchase prior to using your log splitter.